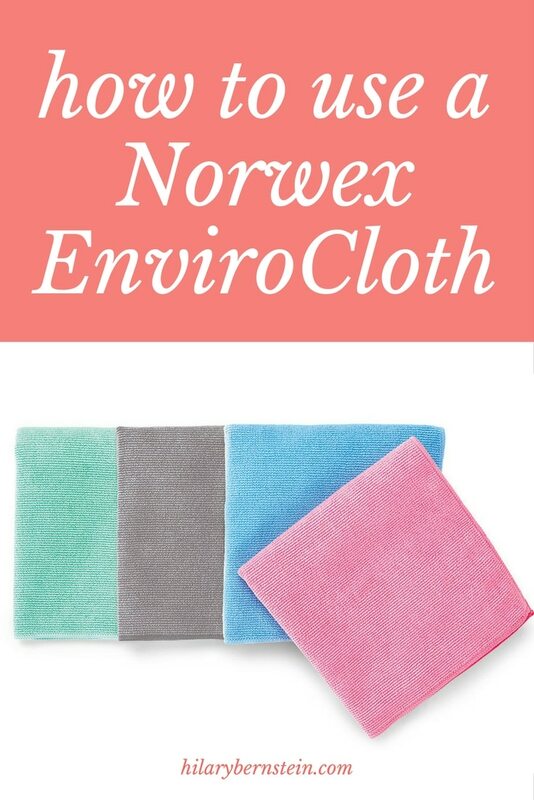 If you’re new to Norwex, it can be confusing to figure out exactly how to use an EnviroCloth. Here’s how I use a Norwex EnviroCloth! That was my very question a few years ago, when a friend told me I could clean my entire house with a Norwex microfiber cloth. Honestly, I didn’t believe her. Didn’t every room – like kitchens and bathrooms – need their own special kinds of cleaners? But my friend cleaned her house with Norwex and loved it. So when I was invited to a Norwex demonstration, I wanted to know exactly what it was. There, I learned how and why a simple microfiber cloth could clean so simply and effectively, with only tap water. What makes the EnviroCloth so special? At the Norwex demonstration, I knew the claims about toxic commercial cleaning products were true. I had pitched mine years before. Would I really use it that much in my home to justify the cost? Would my cleaning routine actually change … especially if I didn’t know what in the world I was doing with the microfiber? It really did work – better than I ever imagined. Cleaning became quick (three cheers for that!) and so easy (three more cheers!). My cleaning routine, that had once consisted of figuring out what cleaners to use on certain surfaces radically changed. 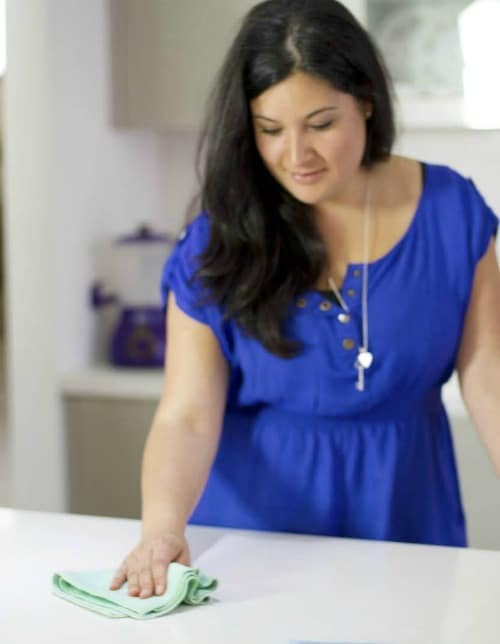 I could throw out all the cleaning products from under my sink – that left a lot more space, plus it made my home safer for my young children – because I only needed to keep an EnviroCloth in a couple of rooms I cleaned the most. The cost of buying one EnviroCloth was justified (I’ve figured that it costs just $1.40 a month, which is really reasonable for a cleaning product!) – enough that I bought several more to designate in different spaces throughout my home. As for figuring out what to use the EnviroCloth for, it’s easy: you can use it to clean just about anything. Now when a cleaning challenge comes up in my home – I find an unexpected stain or I need to scrub something – my EnviroCloth is the first thing I grab. Wipe away splatters in my microwave. Scrub spills in my refrigerator. Wipe out my kitchen sink. Wipe off my countertops and tabletops. Scrub away stains in my carpet. Wipe off greasy fingerprints and handprints from my walls. Clean doorknobs and switch plates. Scrub away stickers that have accidentally been washed and dried on clothes. Scrub grimy, dusty surfaces in my home. Quickly mop my tile floors. Wipe down my bathroom sink and countertop. Wipe out my washing machine tub and dryer. Using a Norwex EnviroCloth is easy: if you’d like to use a wet EnviroCloth, wet it with tap water, wring excess water out, and then use it for your job. 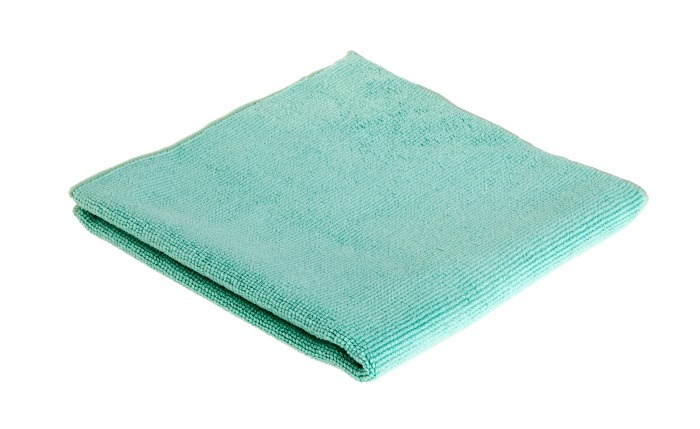 If you fold the Envirocloth after writing out the extra water, once one part of your Envirocloth is dirty from all of your cleaning, you can use another section of your Envirocloth until that gets dirty. By simply folding your EnviroCloth in fourths (folding it in half once, then folding it in half again), you can have eight sides of microfiber for cleaning. Or, if you’re not the folding type, just use the EnviroCloth like a big cleaning cloth. Once your Norwex is dirty in the middle of your cleaning job, rinse it off with clean tap water and start the process over. If you need to use a dry EnviroCloth, you also can fold it and use it just like a wet EnviroCloth. Since I use my EnviroCloth to clean so many different surfaces in every room, I keep several throughout my home. Blue EnviroCloths are only used in my bathroom. And green EnviroCloths are used for lighter cleaning jobs in my home. Aside from being amazingly easy to use and effective, I also appreciate how easy it is to actually clean my EnviroCloths. Unless I’m doing some heavy duty cleaning – like scrubbing down outdoor furniture, wiping up juices from raw chicken, or cleaning my bathroom – I rinse my EnviroCloth out with tap water, let it air dry for 24 hours, and use it again and again. After a week of regular use – or, just one time of heavy duty cleaning (I always, always use my bathroom cleaning EnviroCloths just once) – I rinse them out, let them air dry for a day, and then launder. The laundry process is a simple one. I wash and dry my Norwex microfiber in my washing machine and dryer with other lint-free laundry. I don’t need to wait for a special load of Norwex laundry – although, if I use enough Norwex, I do. I don’t use laundry detergent with optical brighteners. I don’t use liquid fabric softener. I don’t use fabric softening dryer sheets. Those products are harmful to your health – and the residue from these products will destroy the effectiveness of Norwex microfiber. After trying a lot of safe laundry products throughout the past nine years, I really like Molly’s Suds laundry powder, wool dryer balls, and NaturOli SoapNuts. 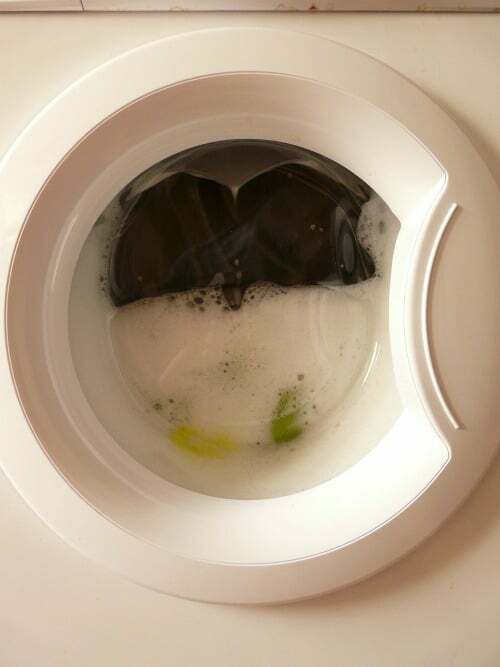 When it comes to replacing fabric softeners, I absolutely love Norwex’s wool Fluff and Tumble Dryer Balls.). Sometimes – after a lot of use – my EnviroCloths seem to be less effective. And sometimes they even might start to stink. When this happens, I know I need to deep clean them. Deep cleaning Norwex microfiber in boiling water helps the microfiber to swell and release any trapped debris. Fortunately, this is easy, too. Simply fill a pot with water and let it boil on your stovetop. Add your Norwex microfiber and boil for ten minutes. Watch that there’s enough boiling water in your pot! (You can also choose to add 1 part white vinegar to 3 parts water.) Then, let air dry and use as you normally would. Norwex EnviroCloths aren’t available at stores. You can either order them from a Norwex sales consultant you already know. Now that I know what Norwex is, I love it. I know the Norwex EnviroCloth works, because it surprises me over and over again with how well it cleans everything. I’m glad that I tried using it, because it’s change my cleaning habits for the better by making them healthier, easier … and quicker! 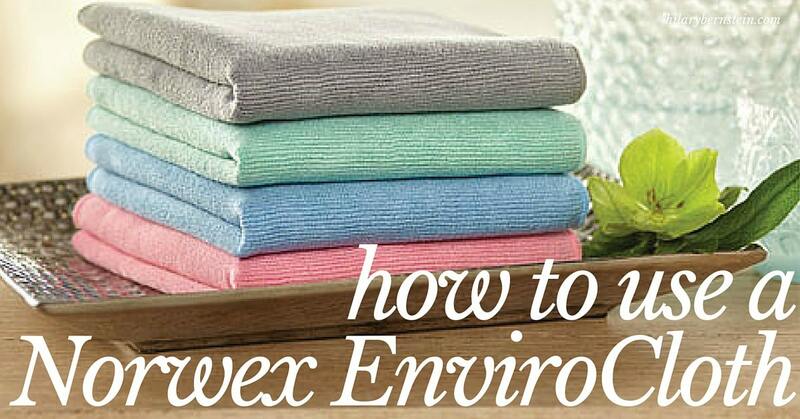 If you already own Norwex products, how do you use a Norwex EnviroCloth? Disclosure: I enjoy Norwex products, but I am not a sales affiliate. All images courtesy of Norwex. Do I have to let the cloth dry before I use it in another room? I just bought the kitchen cloth and was so excited I used it in every room. I did use hot water to rinse it out after each use but did not let it dry 24 hours, was I just spreading germs? I don’t let my cloths dry 24 hours before using them again … unless I’m cleaning an exceptionally germy place, like bathrooms or juices from raw chicken. The weave of Norwex’s microfiber is so tight that it’s possible to rinse and reuse without spreading germs. Is it OK to put the microfiber cloths in the dryer? I put mine in the dryer all the time! But they also can be air dried.